MacDive provides multiple ways to number your dives automatically, or manually should you need to. This is the default behaviour. Each time you download from your dive computer, MacDive will number your new dives starting from the highest number for that computer. This behaviour is particularly useful when you dive with multiple computers (for example, a backup computer) and you like to keep their numbers in line. You can enable this behaviour by visiting Preferences -> Advanced and checking the preference Number dives based on diver. This option will instead number your new dives based on the highest number for your Diver. 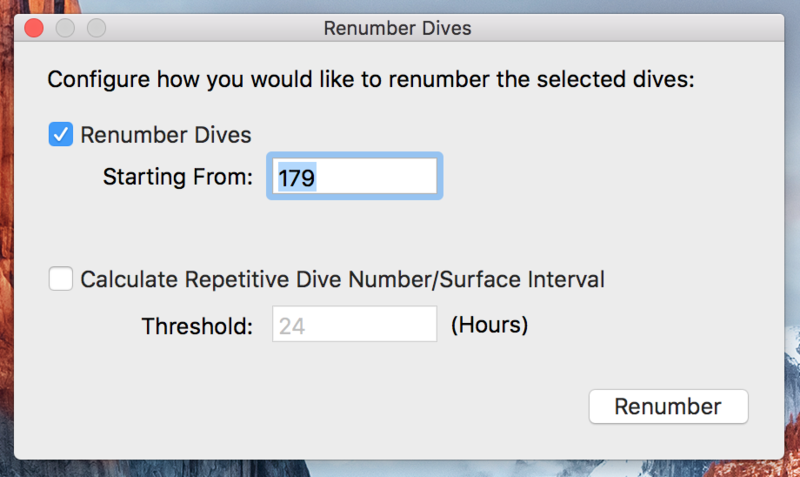 This option can be useful if you like to number all of your dives sequentially, even when using multiple computers. Sometimes you may import data from an alternate source, for example a logbook file, or you may get a new dive computer. The initial download from a new dive computer will start at dive 1, however if you have existing dives you'll likely want to fix that. You will be presented with the Renumber panel. Enter the dive number you would like to start numbering from, and click Renumber.